G Michael Salon in Noblesville Indiana is one of the Top Sponsors of Woofstock and Dog Day Afternoon in Carmel Indiana. Please join them to help raise money for the Humane Society of Hamilton County and have a GREAT time doing it! **Dog Day Afternoon is a day full of shopping, entertainment and family fun! Listen to live bands play throughout the day. Hit the trails for the “Parade of Paws” dog walk and help raise money for shelter pets! 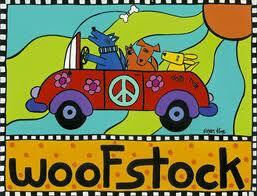 In true “Woofstock” style, there will also be a Woofstock stage with live bands playing all day! Bring a blanket, relax and take in some great music! Everyone! Entertainment, shopping and activities are targeted at all members of your family – from toddlers to adults…and of course, the furry, four-legged ones! Why: To celebrate the bond between pets and their families, and support the Humane Society for Hamilton County! Well-mannered, vaccinated dogs on leashes six foot or shorter are welcome to attend the event! The Humane Society for Hamilton County (HSHC) is a non-profit 501 (c)(3) charitable organization. It is not a United Way Agency, and is not affiliated with any other animal welfare group in the United States. The HSHC also serves as the animal control facility for Hamilton County, and, as such, receives partial funding from Hamilton County. The majority of the HSHC budget is funded by private donors. The HSHC will not euthanize animals for space and time, and will treat sick and injured animals if there’s an outlook for recovery and a high quality of life. Many animals are hit-by-car injured, heartworm-positive, malnourished, or otherwise wounded and/or sick. The HSHC will provide most of these animals with life-saving treatments, surgeries and medications as their best chance for a second chance and until they are re-homed. a $50 feeds our animals for two days. a $100 disinfects the shelter for one week. a $250 vaccinates 10 dogs or cats. a $300 saves the life of a heartworm-positive dog. a $500 spays or neuters 14 dogs or cats. a $1,000 will shelter 20 animals and operate the facility for one week. a $4,500 pays the shelter’s electric bill for one month. Saving Lives. Educating Communities. Completing Families.